Increasing digitization has led to convergence between IT (Information Technology) used in offices and mobile devices, and OT (Operational Technology) that controls devices used in critical infrastructure and industrial control systems. The IoT (Internet of Things) is also rapidly growing, with around 10 billion devices today. 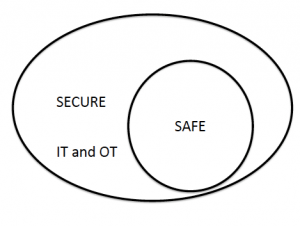 These trends raise concerns about the interaction between safety and security. The reality of the threat has been highlighted in national news coverage, from cyber security vulnerabilities being exploited to compromise vehicle safety, to denial of service attacks launched from consumer devices. Discussions are sometimes hampered by the lack of clear definitions of the concepts. Safety is often understood as concerning protection against accidents, whilst security is about protecting systems against the action of malicious actors. But these two definitions miss some essential aspects of the two concepts. 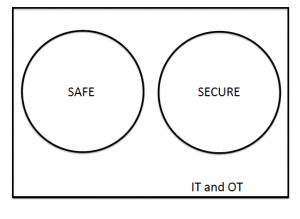 A slightly different view is that safety is about protecting the environment from the system and security is about protecting the system from the environment. Another contrast between the two concepts is how we approach risk assessment. Safety often considers the risk to life and limb and measures risk using actuarial tables. Security more often measures risk through consideration of the threat to information assets – at the moment data breach may be the key concern. 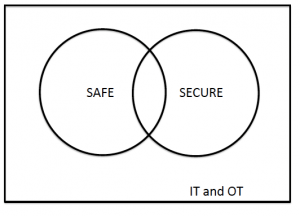 As cyber physical systems become more prevalent there must be a convergence between these different approaches. There are differences between the two concepts and we have hinted at what those might be. However, some commentators, predominantly from the security sector, have questioned whether a system can be safe if it is insecure. This is not universally accepted – some would argue that insecure components can be deployed in a system without compromising the safety because of the way in which those components are deployed and their effect is constrained. 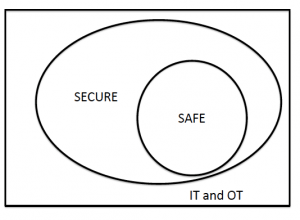 Of course an alternative diagram would represent the secure systems as a subset of the safe ones – this could be verbalized by a slogan that a system cannot be secure if it is not safe. 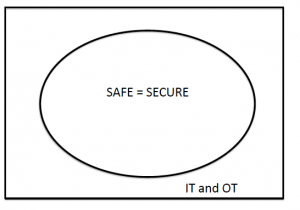 This is clearly wrong; safety, in the way we have viewed it here, is only really an issue for OT systems but we clearly want our IT systems to be secure. I am sure that this is a debate that will continue for some time. Chris Hankin is Director of the Institute for Security Science and Technology and a Professor of Computing Science. His research is in cyber security, data analytics and semantics-based program analysis.